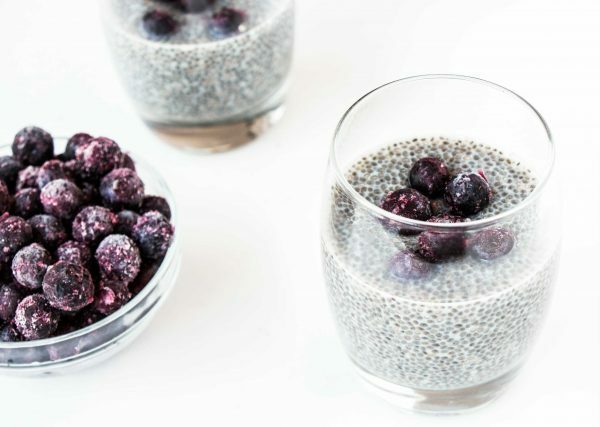 This Blueberry and Ginger Chia pudding explodes with Chia seeds that may only be tiny in size but are one of the most nutritious foods on the planet. Chia seeds are packed full of fibre, protein, Omega 3’s and a array of micro nutrients, along with the mix of Blueberries full of antioxidants to build your immune system, while the ginger is a natural soother for the stomach and aids digestion. A fabulous recipe for dessert which can be enjoyed without the guilt complex as a tasty sweet treat. Blend together blueberries, milk, ginger, cinnamon, and sweetener in blender and adjust to taste. The size of the blueberries can be left a bit chunky if you prefer. Pour the mixture over the chia seeds and stir well. Refrigerate for at least 15 minutes before eating. This Blueberry and Ginger Chia Pudding is very easy to prepare, including doing so the night before required for that special dinner. Great to have ready while enjoying your visitors company who have come for dinner. 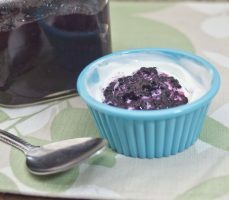 Another tip is you can freeze portions of this Blueberry and Ginger Chia Pudding into small jars or containers and take to work for morning tea as a scrumptious healthy snack. If you like a bit more crunch, add some roasted seeds or nuts to combine these delicate flavours and texture. Try combining with the main meal prior to the Blueberry and Ginger Chia Pudding the Mexican Pizza with Avocado. it is a favourite for the whole family and visitors. I have used it so many times, especially during the football season with wonderful feedback. To add to flavours next time I will put a variety fruit in & add some nuts.